Congratulations to Dr. Jon Thomas on his 2017 Mayo Clinic Alumni Association Professional Achievement Award! We are proud of his accomplishments! Minneapolis/St. Paul, MinnesotaDr. 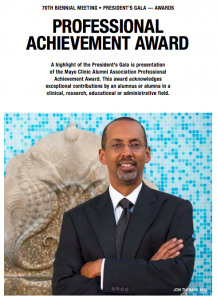 Thomas was awarded the 2017 Mayo Clinic Alumni Association Professional Achievement Award for attaining the highest levels of achievement in and making signi cant contributions to how state medical boards approach telemedicine and how medical licensure portability can improve access to health care across the country.Dr. Thomas was appointed to the Minnesota Board of Medical Practice by Governor Jesse Ventura in 2001. He was reappointed in 2005 and 2010 by Governor Tim Pawlenty, and in 2014 by Governor Mark Dayton. Dr. Thomas served as chair of the Complaint Review Committee from 2003 to 2006, secretary of the board in 2005, vice president in 2006, and president in 2007 and 2012. As president, he also served on the Work Study Group on Controlled Substances, which was instrumental in setting up the prescription drug-monitoring program in the state. He also chaired the Policy and Planning Committee and the Continuing Competency and Maintenance of Licensure Task Force.Dr. Thomas has been active with the Federation of State Medical Boards, where he served on the board of directors and in various other leadership capacities. The federation represents the nation’s 70 state medical and osteopathic boards and co-sponsors the United States Medical Licensing Examination (USMLE). Appropriate Regulation of Telemedicine (SMART) Workgroup to develop model guidelines for appropriate use of telemedicine. He also provided leadership and marshalled the development of the Interstate Medical Licensure Compact. His work in these areas clari ed state medical boards’ approach to telemedicine and support of a novel way to enable medical licensure portability that will improve access to health care across the country.